The hand hammered copper covering the top of this handcrafted, Western style console has a lovely patina, and the copper patina will become more interesting and more beautiful with each passing year. The top rest on a solid wood base, and the front of the base is embellished with gorgeous, hand carved, floral and scroll designs. Each top corner of the front of the base is adorned with a hand forged, iron scroll design. 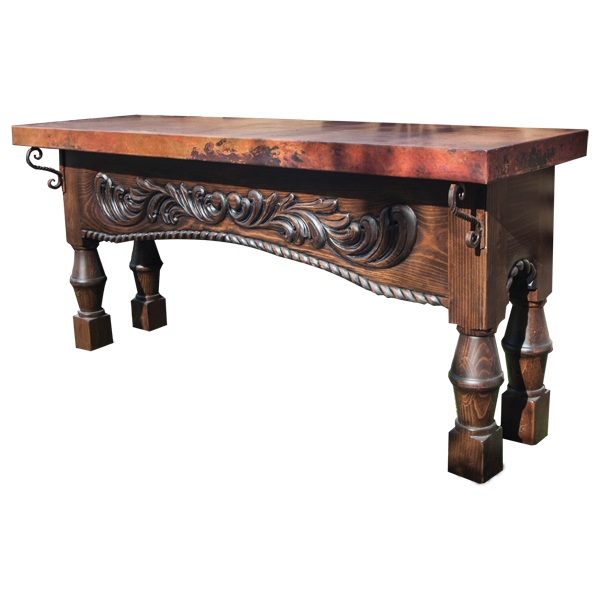 The lower part of the base is enhanced with an ornate, hand carved, twist rope design, and this design is repeated on the lateral sides of the console. The console rest on exquisite, hand turned legs, and end in square cut feet. It is made with the best, sustainable, solid wood available, and it is 100% customizable.